For other uses, see Moth (disambiguation). Moths comprise a group of insects related to butterflies, belonging to the order Lepidoptera. Most lepidopterans are moths, and there are thought to be approximately 160,000 species of moth, many of which have yet to be described. Most species of moth are nocturnal, but there are also crepuscular and diurnal species. While the butterflies form a monophyletic group, the moths, comprising the rest of the Lepidoptera, do not. Many attempts have been made to group the superfamilies of the Lepidoptera into natural groups, most of which fail because one of the two groups is not monophyletic: Microlepidoptera and Macrolepidoptera, Heterocera and Rhopalocera, Jugatae and Frenatae, Monotrysia and Ditrysia. Although the rules for distinguishing moths from butterflies are not well established, one very good guiding principle is that butterflies have thin antennae and (with the exception of the family Hedylidae) have small balls or clubs at the end of their antennae. Moth antennae are usually feathery with no ball on the end. The divisions are named by this principle: "club-antennae" (Rhopalocera) or "varied-antennae" (Heterocera). The modern English word "moth" comes from Old English "moððe" (cf. Northumbrian "mohðe") from Common Germanic (compare Old Norse "motti", Dutch "mot", and German "Motte" all meaning "moth"). Its origins are possibly related to the Old English "maða" meaning "maggot" or from the root of "midge" which until the sixteenth century was used mostly to indicate the larva, usually in reference to devouring clothes. Moth larvae, or caterpillars, make cocoons from which they emerge as fully grown moths with wings. Some moth caterpillars dig holes in the ground, where they live until they are ready to turn into adult moths. Moths evolved long before butterflies, with fossils having been found that may be 190 million years old. Both types of Lepidoptera are thought to have evolved along with flowering plants, mainly because most modern species feed on flowering plants, both as adults and larvae. One of the earliest species thought to be a moth-ancestor is Archaeolepis mane, whose fossil fragments show scaled wings similar to caddisflies in their veining. An adult male pine processionary moth (Thaumetopoea pityocampa). This species is a serious forest pest when in its larval state. Notice the bristle springing from the underside of the hindwing (frenulum) and running forward to be held in a small catch of the forewing, whose function is to link the wings together. Some moths, particularly their caterpillars, can be major agricultural pests in many parts of the world. Examples include corn borers and bollworms. The caterpillar of the gypsy moth (Lymantria dispar) causes severe damage to forests in the northeastern United States, where it is an invasive species. In temperate climates, the codling moth causes extensive damage, especially to fruit farms. In tropical and subtropical climates, the diamondback moth (Plutella xylostella) is perhaps the most serious pest of brassicaceous crops. Also in sub-Saharan Africa, the African sugarcane borer is a major pest of sugarcane, maize, and sorghum. Moth larvae may be killed by freezing the items which they infest for several days at a temperature below −8 °C (18 °F). Despite being notorious for eating clothing, most moth adults do not eat at all. Many, like the Luna, Polyphemus, Atlas, Promethea, cecropia, and other large moths do not have mouth parts. While there are many species of adult moths that do eat, there are many that will drink nectar. Some moths are farmed for their economic value. The most notable of these is the silkworm, the larva of the domesticated moth Bombyx mori. It is farmed for the silk with which it builds its cocoon. As of 2002[update], the silk industry produces more than 130 million kilograms of raw silk, worth about 250 million U.S. dollars, each year. Not all silk is produced by Bombyx mori. There are several species of Saturniidae that also are farmed for their silk, such as the ailanthus moth (Samia cynthia group of species), the Chinese oak silkmoth (Antheraea pernyi), the Assam silkmoth (Antheraea assamensis), and the Japanese silk moth (Antheraea yamamai). The larvae of many species are used as food, particularly in Africa, where they are an important source of nutrition. The mopane worm, the caterpillar of Gonimbrasia belina, from the family Saturniidae, is a significant food resource in southern Africa. Another saturniid used as food is the cavorting emperor (Usta terpsichore). In one country alone, Congo, more than 30 species of moth larvae are harvested. Some are sold not only in the local village markets, but are shipped by the ton from one country to another. Nocturnal insectivores often feed on moths; these include some bats, some species of owls and other species of birds. 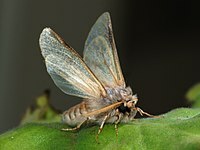 Moths also are eaten by some species of lizards, cats, dogs, rodents, and some bears. Moth larvae are vulnerable to being parasitized by Ichneumonidae. Baculoviruses are parasite double-stranded DNA insect viruses that are used mostly as biological control agents. They are members of the Baculoviridae, a family that is restricted to insects. Most baculovirus isolates have been obtained from insects, in particular from Lepidoptera. There is evidence that ultrasound in the range emitted by bats causes flying moths to make evasive maneuvers because bats eat moths. Ultrasonic frequencies trigger a reflex action in the noctuid moth that causes it to drop a few inches in its flight to evade attack. Tiger moths also emit clicks which can foil bats' echolocation. The fungus Ophiocordyceps sinensis infects the larvae of many different species of moths. Moths frequently appear to circle artificial lights, although the reason for this behavior (positive phototaxis) remains unknown. One hypothesis is called celestial or transverse orientation. By maintaining a constant angular relationship to a bright celestial light, such as the moon, they can fly in a straight line. Celestial objects are so far away that, even after travelling great distances, the change in angle between the moth and the light source is negligible; further, the moon will always be in the upper part of the visual field, or on the horizon. When a moth encounters a much closer artificial light and uses it for navigation, the angle changes noticeably after only a short distance, in addition to being often below the horizon. The moth instinctively attempts to correct by turning toward the light, thereby causing airborne moths to come plummeting downward, and resulting in a spiral flight path that gets closer and closer to the light source. Studies have found that light pollution caused by increasing use of artificial lights has either led to a severe decline in moth population in some parts of the world or has severely disrupted nocturnal pollination. ^ "Moths". Smithsonian Institution. Retrieved 2012-01-12. ^ Scoble, MJ 1995. 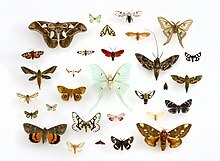 The Lepidoptera: Form, function and diversity. Oxford, UK: Oxford University Press; 404 p.
Studying the evolution of butterflies and moths is challenging, since fossils are so rare. But the few Lepidopteran fossils that exist, captured in amber or compressed in fine-grained rocks, show great detail. The earliest Lepidopteran fossils appear in rocks that are about 190 million years old. These tiny fragments of scaled wings and bodies clearly indicate that moths evolved before butterflies. ^ The First Decade of Genetically Engineered Crops in the United States Archived 2010-06-22 at WebCite. USDA. ^ Conlong, D.E. (February 1994). "A review and perspectives for the biological control of the African sugarcane stalkborer Eldana saccharina Walker (Lepidoptera: Pyralidae)". Agriculture, Ecosystems & Environment. 48 (1): 9–17. doi:10.1016/0167-8809(94)90070-1. ^ a b Scott, Thomas (1995). Concise Encyclopedia Biology. Walter de Gruyter. ISBN 3-11-010661-2. ^ "Silk Exchanges of Tamil Nadu and Andhra Pradesh". Central Silk Board of India. Archived from the original on March 7, 2007. gives silk prices in rupees. Exchange rate is about 50 RS to dollar. ^ "Some Edible Species". Food-Insects.com. Archived from the original on 2014-11-07. ^ Some Moths Escape Bats By Jamming Sonar (video). npr.org. July 17, 2009. ^ Baral, B (Feb 2017). "Entomopathogenicity and biological attributes of Himalayan treasured fungus Ophiocordyceps sinensis (Yarsagumba)". Journal of Fungi (Basel). 3 (1): 4. doi:10.3390/jof3010004. PMC 5715966. PMID 29371523. ^ "National Mission on Himalayan Studies". nmhs.org.in. Retrieved 2018-11-04. ^ Singh, Shiv Sahay (2018-10-28). "Moths are key to pollination in Himalayan ecosystem". The Hindu. ISSN 0971-751X. Retrieved 2018-11-04. ^ "Why Are Moths Attracted to Flame?". npr.org. August 18, 2007. ^ "The pollinator night shift: Moths and light pollution". Bee Coalition. Retrieved 2018-11-04. ^ van Langevelde, Frank; Braamburg-Annegarn, Marijke; Huigens, Martinus E.; Groendijk, Rob; Poitevin, Olivier; van Deijk, Jurriën R.; Ellis, Willem N.; van Grunsven, Roy H. A.; de Vos, Rob (2018-01-04). "Declines in moth populations stress the need for conserving dark nights". Global Change Biology. 24 (3): 925–932. Bibcode:2018GCBio..24..925V. doi:10.1111/gcb.14008. ISSN 1354-1013. PMID 29215778. ^ "The State Of Britain's Moths". butterfly-conservation.org. Retrieved 2018-11-04. ^ Macgregor, Callum J.; Evans, Darren M.; Fox, Richard; Pocock, Michael J. O. (2016-07-12). "The dark side of street lighting: impacts on moths and evidence for the disruption of nocturnal pollen transport". Global Change Biology. 23 (2): 697–707. doi:10.1111/gcb.13371. ISSN 1354-1013. PMID 27251575. ^ Knop, Eva; Zoller, Leana; Ryser, Remo; Gerpe, Christopher; Hörler, Maurin; Fontaine, Colin (2017-08-02). "Artificial light at night as a new threat to pollination". Nature. 548 (7666): 206–209. Bibcode:2017Natur.548..206K. doi:10.1038/nature23288. ISSN 0028-0836. PMID 28783730. ^ Tait, Malcolm (2006). Animal Tragic: Popular Misconceptions of Wildlife Through the Centuries. Think Books. p. 38. ISBN 978-1-84525-015-7.